Toronto, June 05, 06 & 07 1990, The O'Keefe Centre For The Performing Arts. 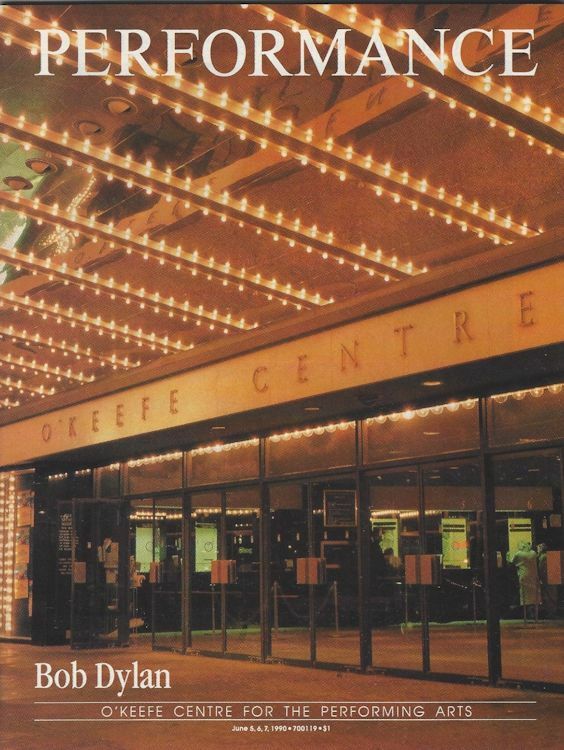 The O'Keefe (now Sony) Centre for the Performing Arts is a major performing arts venue in Toronto, Ontario, Canada, and it is the country's largest soft-seat theatre. The building opened on 1 October 1960, and it has hosted a variety of international actions and stars, with a capacity of 3191 seats. Concert programme handed out at the performances on June 05, 06 & 07 1990. Over 118 pages, it contains articles and advertisements for upcoming shows at the venue, advertisements for various restaurants in the area, and a several page article and interview with Bob Dylan by Scott Cohen, titled "Don't Ask Me Nothin' About Nothin' I Might Just Tell You The Truth: Bob Dylan Revisited", interviewed.